It all started with a simple gift. We had just moved to Oklahoma and my sister-in-law got us a Keurig machine as a housewarming present. The machine came with a wide range of flavored k-cups. We tried them all and over time I found that I actually liked coffee. The kids liked the sugary powdered stuff but once the samples of those ran out we didn’t buy any more. Too much junk in them. As I began to use the machine more regularly, I would only have one or two cups a day as at that time I preferred my caffeine cold (soda). During the same time I was given a rule of thumb by my brother-in-law: 50 cents or less on a k-cup was a “good deal”. Things stayed about the same for a couple years (a cup of coffee or so each day). Then we moved from Oklahoma to Colorado (colder temps call for warm drinks) and I gave up soda. Now I was drinking two cups of coffee a day every day — one at home and one at work. My knowledge of coffee was about zero then (it’s still not great), but that was about to change. As I transitioned into my new job, I befriended several people at work who regularly went to coffee shops for breaks during the day. Every so I often tagged along and got something. As time went on I also ran into people in the office who brought their own coffee to work and made it there. There were even some who roasted their own beans. As I began to ask questions I discovered that coffee was way more than putting some grounds in a machine and watching it drip out. People were more adamant about their coffee than they were about their religion or their politics. They all had strong opinions on what beans to use, the best way to grind them, the best brewing methods, etc. Everyone had their own process and theories and as you might imagine, they often contradicted each other. I was still mostly using my Keurig machine until the last few weeks at work — when things were winding down. I needed more than just a couple cups to get me through each day. It was during this time that a friend sent me a $10 Starbucks gift card as a present. Using it I discovered the Venti Cafe Latte. Oh, and the Starbucks app, of course. You load dollars on your app via credit card and then pay through the app. This is cool, but by far the best thing about the app is that you can use it to order remotely. I would often walk to Starbucks and order my drink on my phone when I was a few minutes away. I would walk in, walk past the 10 people in line waiting to order and the 10 people waiting for their drinks to be made and pick up my drink, which would be sitting on the counter. In short, the app saves a TON of time. Since I’m not a great stand-in-line-and-wait-20-minutes-to-get-a-coffee kind of guy, I LOVED this part of the app. By coming to understand what I call The Latte Factor, you are now going to change all that. You’re going to become more aware of how much you are wasting on “small things” — and how to redirect that wasted money to help you build a fortune. It doesn’t matter if you earn what you think is a small paycheck. Regardless of how big or small your income is, by making use of The Latte Factor you can start to build real wealth and ultimately more freedom. 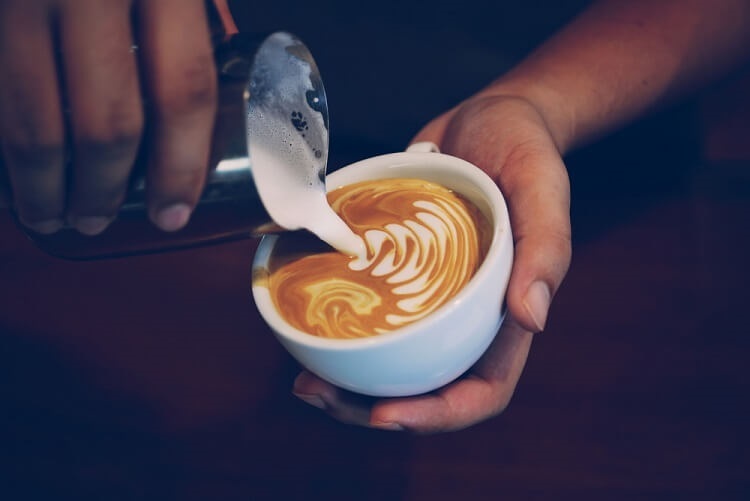 Over the past few years, The Latte Factor has become an internationally recognized metaphor for how we dribble away what should be our fortunes on small things without ever really giving it much thought. Now of course he isn’t just talking about coffee. The small spending could be anything: cigarettes, bottled water, soft drinks, candy bars, fast food, and on and on. The idea is that the small things add up. That said, I do agree that small spending can add up, so we all need to be aware of it (by tracking spending with a budget or some other process — I use Quicken) and make informed decisions accordingly. Once you know what you’re spending, you can decide where to spend a bit more and where you are ok to cut back. I call this moderate and selective frugality and the items picked to spend will be different for us all based on our desires. The cost of coffee wasn’t that big of an issue to me when I was spending 50 cents or $1 on k-cups, but I had grown into a $4.60 per cup habit! Yikes! Now I was all ready to retire and I could afford this, but I still got to thinking: this sort of habit could really add up for someone. Then I thought of my friends at work who went to Starbuck two or three times a day. I knew they made one-third of what I did. How were they affording this? And it wasn’t just them. Starbucks was almost always packed both inside as well as had a line of cars in the drive through. How was America affording this? Before you say no one spends $18.40 a day on coffee, consider this is what a family spends if the husband and wife each have only two coffees a day. I used 8% and he used 10%. I think 8% is more reasonable. I used 25 years and from what I can tell it looks like he used more like 40 or 45 years. That said, the conclusion is the same: a lot of money can flow out of your life in small amounts here and there. Got my own beans — I bought four different varieties from Walmart and began testing them out in various grinds, amounts (ounces), and mixes with milk. Got a hand coffee grinder — it was a small, cheap start but a real pain (I got it because a friend at work said it was the best way to go. I should have known better since she’s a “coffee purist.”) I quickly moved to a Proctor Silex E167CY Fresh Grind Coffee Grinder . Less than $10 and works like a DREAM!!!!! I also found a couple pieces on saving money at Starbucks with several tips I want to employ. Check out 10 Best and Worst Deals at Starbucks and Starbucks Rewards boost: More. Free. Coffee. for details. I know. I took the long way around to get to the point. The point is that small amounts of spending here and there can really add up. We all need to watch them and be on our guard or else we could easily be throwing away a few hundred thousand dollars. What areas do you have where you spend small amounts on a regular basis? There are many opportunities to calculate the daily expense on items purchased or monthly subscriptions. Some are necessary and others I justify as increasing the quality of our lives. Then I think of our after tax income calculated per day (including weekend days) and deduct the expenses above to determine what I have as net income. I typically use the the daily income minus the daily expense to justify the expenses of the needs/wants. Subscriptions are a small ongoing monthly expense but they add up quickly. I would love to get a $15/month subscription to the New York Times but can not justify the $0.50 daily cost. I’ll make do with the 10 free articles per month. This is a good funny example of the Latte factor. I have been a coffee drinker since I was ten years old because me and my dad use to sit on the couch in the mornings and talk before anyone would be up. We still do when I visit and making memories. Yes all these little things add up to big savings but people do them for various reasons and the one I see “befriended people who took breaks and went to coffee shops”. The same can be said for lunch in people eat out at lunch to get away from work and socialize with co workers. All this adds up to money being sucked out of your wallet instead of being saved in your bank account and people do them without thinking. That is the main thing I got from the Auto Millionaire. It is not just the small but every bill can have a savings. Cell phone plans that are too large, cable or internet bills, electric and heat. Even a vehicle purchase. Hey that sun roof is only costing me $x a month. Do I really need a sunroof? Unused gym memberships, unread magazines, minimally used netfix, hulu or other streaming subscriptions. It all adds up. Oh and for the record I drink my coffee black and strong. No sugar, no cream, sometimes hazelnut but mainly plain made in a Krups coffee maker. No Keurig for me in that even though they make great coffee ,they are not cheap as you are pointing out. Nothing fancy for me and 6 cup pot usually does the trick. I am not a coffee drinker but I sometimes drink tea at home. The big spending that I see every day, besides Starbucks, is food not prepared at home. My 20 year old and her friends almost never consider how expensive it is to eat out but they do it all the time, often take-out. We are generally disappointed with meals out – the quality, lack of healthfulness, service, menu choices, etc. We save a lot of money by only eating out occasionally. The other biggie I see is media consumption. Whether it’s buying books and magazines or paying a lot for cable, cell phone data plans, and the like. I am a tea drinker and I currently grow my own mint tea. I pick it, dehydrate it, and store it throughout the spring/summer/fall. It tastes better then most teas to me, is healthier, and saves me money. Small changes can add up. Once retired I no longer needed to spend the money on gas, auto and subway traveling costs like parking and fares. That alone saved me Over $300 a month. I no longer need expensive clothes, shoes, and other work items. That saved at least $2000 a year. Then I also saved on lunches and dinners due to working when I could not pack a meal. Well that added up $2760 minimum a year. That made a total of $8360 yearly I saved at least. You raise a good point about these small expenses. They are so small, that people don’t think about how they are adding up over time. At work I see it all the time. There are people that order out for lunch EVERY DAY and I know for a fact that their income level does not support it. If they bothered to add up the costs, I’m sure they would be shocked. Luckily for us, we get free coffee at the office. And while I enjoy a good Starbucks coffee as much as the next guy, I only buy them when I am on business and can expense them! Otherwise, at home, we drink instant [Gasp! ]…I don’t mind the taste. Small quibble: I’m not sure but it seems like you multiplied a 7 day week for the coffee at work things when for many of us it would only be 5 days. Still would amount to large savings over years as you calculated, but not quite as much. Good point…thanks for bringing it up. I love the math! I know many people say not to sweat the small stuff, but it really does add up. We are very disciplined with the small stuff, at least as far as purchases go. I think where we fail the most is on the smaller monthly expenses that are automatically paid. I try to give these expenses a once over now and then, but many of the smaller ones (such as a $5 subscription), I let go because they are small. This was a good reminder to take a good, hard look at the monthly bills. Awesome post, ESI, and spot on! I can relate in so many ways, but I definitely have tried to cut out the small things in my pursuit of FI. And I was recently turned onto roasting my own coffee beans as well. I haven’t tried it yet, but next time I need to restock my at-home coffee I plan to. I also have been all about cold brew lately and put a post together on my recent addiction. I save this mostly for the weekends though, as I get my coffee free from work (a shared Keurig that the office stocks). For me, it’s not coffee…it’s Sonic Happy Hour drinks and little fast food stops. I’m limiting myself more now that I’m losing weight, which is awesome, but yeah…a $1.25 drink here and there adds up fast! I come at it from a different angle. Starbucks is a treat for me at work that might happen once a month. For the basic, normal sized, nothing fancy cup of coffee the cost is what I can get a tall container of half n half at Aldis. It’s painful every time I pay for that simple cup of coffee. I also get the 3lbs of Kirkland coffee in a metal tin at Costco for $11 or $12. Tastes great. So between the cheap half n half and Kirkland brand excellent coffee, I spend 62 cents a day for all of the coffee (3-4 cups) I drink. I do the same comparison with other actions. There is just a lot I can do for myself at home versus spending the money for someone else to do it. All the extra money at the end of a pay period goes to savings or investments. Few dollars here and there add up.